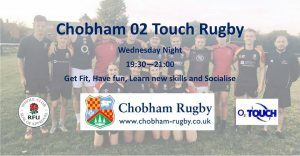 It’s fun, inclusive, improves your fitness levels and open to complete beginners or for ex-players who don’t want to play the full contact game. Our new Wednesday evening format launched on the 9th January where we play under the floodlights on the training pitch starting at 7-30pm – 9.00pm with a short warm up and some handling skills before picking teams and playing for about an hour. The bar is now open on the Wednesday evening too – so come along and join in the fun and stay for a drink afterwards!!! Come along this Wednesday and Give it a Try!